All right, I will be the first to admit these cupcake reindeers look a little disturbed, and lack a huge amount of artistic talent, but hey, I had fun, and they at least give a good laugh, right? 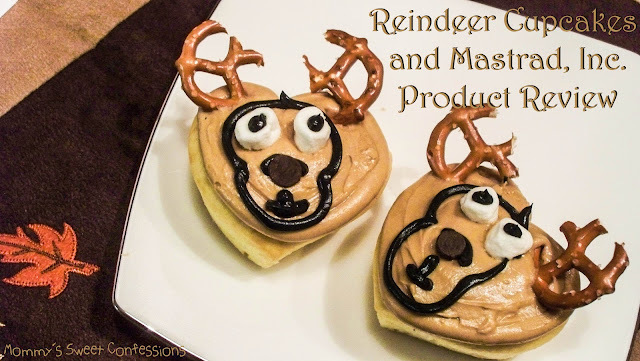 Maybe these are reindeer after they got in to a bunch of Santa's eggnog. 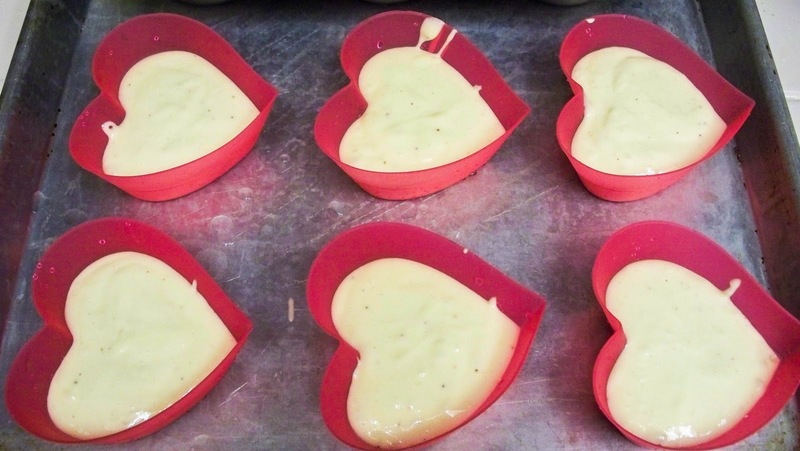 Mastrad, Inc., a French company specializing in culinary accessories, was kind enough to send me a pack of six silicon heart shaped baking cups for me to try out and review. At first, I was a bit perplexed as to what I could do with them, since it wasn't Valentine's Day, but then I started thinking, and thought that maybe, just maybe, I could make some reindeer cupcakes out of them. If you squint your eyes a little, you can see how one could get a face in the center of the heart, and then the rounded parts kind of the antler section. 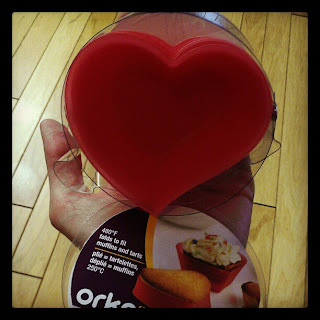 I have used silicon bakeware before, and sadly was not very impressed, so I was a little skeptical of how silicon baking cups would work, but I was still very excited, and within a few hours of receiving them, I was ready to put them to the test! Here is what they look like when they arrive. A cute little box of pretty red cups, about the size of the palm of my hand. They are made of thin, silicon material, and the sides can be folded down in half to make a tart sized cup (which I will be giving a try next with something chocolate related). The line to fold them also marks where to fill them too as well. I put them on a baking sheet, and filled them to the line marked on the cups, no guess work here! I filled them with an eggnog cake batter (which will be my next post). They didn't bend or spill, or anything. I also did not spray the cups with any non stick spray. I baked them along side a traditional cupcake pan to compare baking times (I am a chemist, so I have to take a scientific approach to this). They baked at 350 degrees F. (they are oven safe up to 480 degrees F.) Below is what they looked like when they came out of the oven. They rose perfect, did not over flow, but were plenty big. they cooked in the same amount of time as the traditional pan as well. When I took them out of the cups, all I had to do was peel the sides away, turn it over, and tap it a few times on the bottom and it came right out. Not a single one stuck to the cup, and they came out beautifully. Here is how I decorated them. 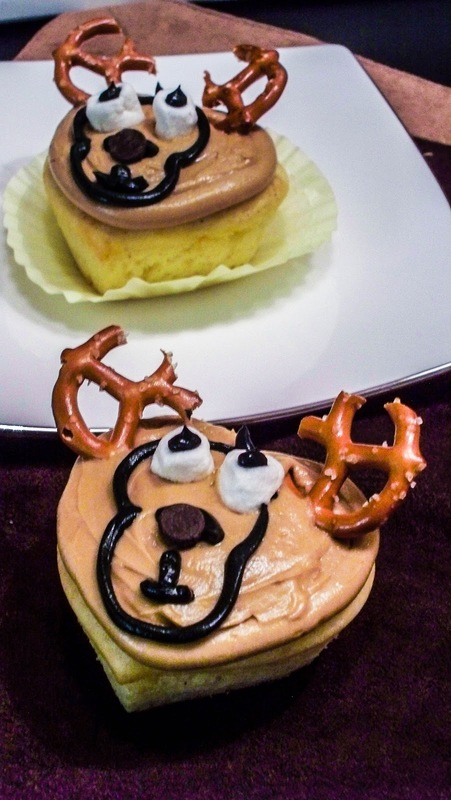 I colored a bit of the buttercream frosting with some black food coloring to outline the face, and put pretzel pieces for the antlers, mini marshmallows for the eyes, and a chocolate chip nose. All in all, I thought they were a great use of the heart shaped cups. 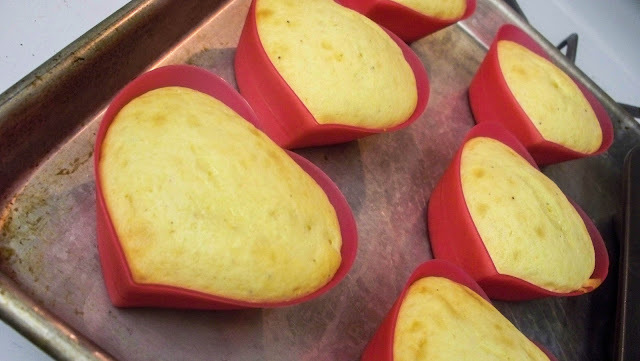 The best part is, they fit perfectly in a regular cupcake liner after you take them out, so you can just pop them in the paper liners and store them that way. Overall I was very impressed with these, despite being skeptical at first. I will be using these again for sure. The only drawback to them is that there are only 6 in a package, so it will take several batches of baking to get through one batch of batter. Otherwise, they performed as described. If you want to check out their products, you can find them at Mastrad, Inc., on Facebook at Mastrad US, and on twitter at Mastrad. If you would like to check this product out, it can be found here. Disclosure: This product was furnished by the manufacturer to review. All comments and opinions of the product are my own.